The only thing better than a Baylor Business entrepreneur is a Baylor Business entrepreneur who builds up more of his kind. Eric Fernandez, co-founder of sports marketing agency 4FRONT, knows there is something special about Baylor graduates. 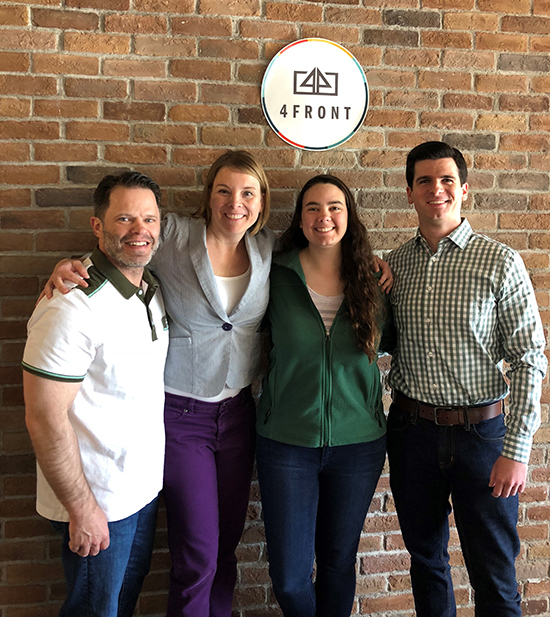 Under the leadership of Fernandez, 4FRONT currently employs three Baylor graduates and hires interns from Baylor’s Sports Strategy and Sales program every summer. At its core, 4FRONT incorporates four core competencies: Analytics, Digital, Innovation and Partnerships. Started in Chicago in 2007 as Property Consulting Group, 4FRONT expanded its business in a 2011 merger with Fernandez’ then-agency called SportsDesk Media. Together, the two firms became PCG SportsDesk, recently rebranded as 4FRONT, to offer clients the complete sports marketing experience. Combining PCG’s innovation with SportsDesk’s marketing expertise has allowed the company to excel in helping clients drive revenue through digital media and analytics. 4FRONT now boasts a variety of sports and entertainment clients such as the Oklahoma City Thunder, Hendrick Motorsports, UFC and Richmond Raceway. While many driven and successful employees contribute to the company’s success, Baylor students and alumni have recently begun to play a large role in the Dallas office, largely thanks to Fernandez. Fernandez graduated from Baylor’s Hankamer School of Business in 1994 with a bachelor’s degree in Finance and went on to spend 14 years as AT&T’s executive director of sponsorships and senior vice president at MediaLink, a media advising firm based in Los Angeles and New York City. His background in sponsorships allowed Fernandez to bring valuable knowledge of what corporate sponsors are looking for to 4FRONT. Wielding his experience with generosity, Fernandez serves as an executive advisory board member for Baylor’s S3 program and seeks out Baylor students for internships—a pattern which has resulted in three Baylor Bears joining the 4FRONT team full-time. Byers, a fellow Baylor alumnus, has been at 4FRONT for three years and appreciates the way Baylor’s Sports Strategy and Sales program, directed by Dr. Kirk Wakefield and Darryl Lehnus, prepared him for career excellence. Joining Fernandez, Byers and Penland this June is recent S3 and Economics graduate Cory Winkler. Including interns, Winkler will make for eight Bears in the office this summer.